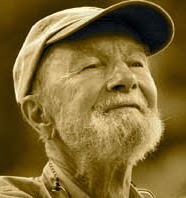 A Year of Being Here: Pete Seeger: "To My Old Brown Earth"
"To My Old Brown Earth," by Pete Seeger. Words and music by Pete Seeger. © 1958. © 1964 (renewed) by Stormking Music, Inc.
Video credit: From "Pete Seeger: The Power of Song," directed by Jim Brown for the PBS "American Masters"series, © 2007. If you can't see the viewer above, click here to watch the video.